LOS ANGELES, Feb. 12, 2019 /CNW/ -- The Southern California CityPASS® program recently transitioned to a build-your-own custom experience that allows travelers to create their ideal vacation by fashioning a discounted, tailor-made ticket package to any combination of the following top attractions. The Disneyland® Resort (Disneyland® Park and Disney California Adventure® Park), where the highly anticipated Star Wars: Galaxy's Edge—a new land featuring rides, entertainment and characters inspired by the "Star Wars" movie franchise—is scheduled to open in summer 2019. SeaWorld®San Diego, where rides, shows, tours and attractions dazzle both thrill seekers and animal lovers. And just in time for summer 2019: Guests can experience Tidal Twister, the world's first-of-its-kind horizontal, dueling roller coaster. LEGOLAND® California Resort, designed for kids ages 2-12, features more than 60 rides, shows and attractions. Its newest ride, LEGO® City: Deep Sea Adventure, immerses guests in an underwater submarine adventure. The park is also celebrating its 20th anniversary in 2019. Ticket options include LEGOLAND Park, SEA LIFE® aquarium and the seasonal LEGOLAND® Water Park, plus discounts at LEGOLAND Hotel and LEGOLAND Castle Hotel. 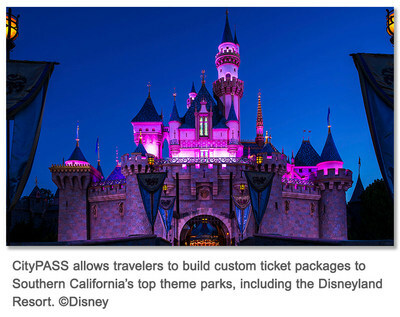 "We're thrilled to be partnering with Southern California's most famous theme parks to offer a simple solution for creating the perfect vacation—all while saving time and money," said Megan Allen, CityPASS president and CEO. "Planning a family trip can be stressful. We set out to design an easy, one-stop shopping experience that greatly reduces that pressure and bundles all your admission tickets into one convenient deliverable." About CityPASS: For more than 20 years, CityPASS tickets have been premier products for travelers who want to visit a destination's top attractions while enjoying significant savings. CityPASS tickets, which have a 97 percent customer recommendation rating, are currently available in 14 North American destinations: Atlanta, Boston, Chicago, Dallas, Denver, Houston, New York City, Orlando, Philadelphia, San Francisco, Seattle, Southern California, Tampa Bay and Toronto. For more information, visit CityPASS.com.